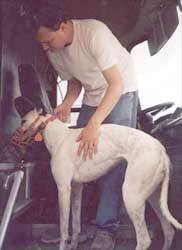 The Greyhound Adoption League of Texas, Inc. ("GALT") received 64 greyhounds when Valley Race Park in Harlingen, Texas, closed for the season on April 6, 2003. Of the 64, GALT took seven of the dogs and the remainder went to adoption groups located from Kansas to Pennsylvania - a total of 12 groups. But let's step back a little with some background. The Harlingen track was not known as an adoption-active track. However, this year GALT and the Valley Operations' Manager succeeded in having an adoption presence at the track. 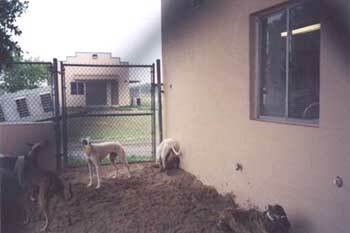 GALT's Harlingen odyssey began in January 2003, when it was learned that there were some greyhounds at risk at the Valley Race Park track. John and Susie McQuade, GALT board members, immediately stepped up and said GALT would take all the dogs. 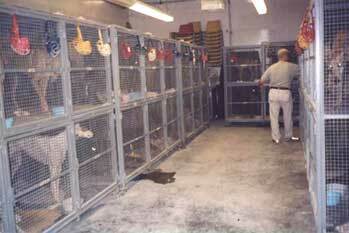 That was the beginning of GALT's adoption operation in the Valley of Texas. GALT Board Members, John McQuade and Noel Padden, negotiated with the Valley Race Park manager to operate an onsite adoption service. Through tireless effort and with GALT's backing, GALT's Valley Operations' Manager made inroads with the trainers, who then began releasing greyhounds to GALT for adoption. A greyhound-friendly vet and a greyhound-friendly boarding facility were located and the rest, as they say, is history. Although GALT received a number of greyhounds from that time forward, it was anticipated that there would be an influx of greyhounds when the track closed for the season. Having not been through this before, GALT was not sure what to expect. GALT sent the word out to groups all over the country giving them advance notice that it might have a large number of greyhounds in April who would need homes. 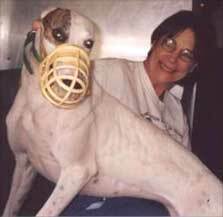 Although GALT had absorbed most of the released greyhounds up until the time of the track closing, it did not have the kennel capacity to accept a large number of greyhounds at one time. Through the McQuades' contacts with Alane Shultz of GPA - Springfield, Missouri along with Kate Bressler and Ann Peterson of Greyhound Support of Kansas City, GALT was able to garner support for this mission. Alane, Kate and Ann, along with Cynthia Cash, had experience with organizing this type of haul and were more than willing to help. GALT contacted Roger Robinette of TLC Express, who owns and operates an air-conditioned and heated bus (like a Greyhound bus) that has been reconfigured to contain space to transport 66 dogs. He was willing to drive from his home in Kansas to Harlingen, Texas, to pick up the dogs and deliver them all the way to Pennsylvania with a two day stop in Abilene, Kansas. There was a delay and complication this year that was somewhat unusual. Because the total trip from Harlingen, Texas to Philadelphia, PA is almost 1900 miles, which translates to over 32 hours straight driving time, it was necessary for the greyhounds to stop and rest for a day or two. Due to an outbreak of a strain of kennel cough, there were some tracks throughout the country that were quarantined and would not allow any incoming greys. However, Gary Guccione offered the NGA kennels in Abilene, Kansas, but because of the Spring Meets, the kennels would not be available until Wednesday, April 30. This delayed the transfer of greys to adoption groups for more than three weeks. When it was determined the number of dogs that could be transported at one time, that fixed the number of dogs that could be accepted by GALT. Because of GALT's good working relationship with Valley Race Park, GALT was provided space at the track for its use as an adoption kennel. 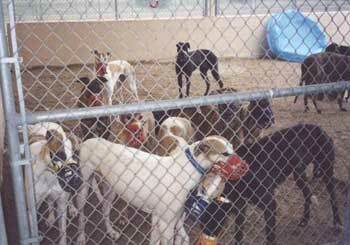 Shortly after the track closed on April 6, 2003, GALT received 64 greyhounds into its program for adoption. GALT volunteers and the hired kennel help worked tirelessly. Every greyhound was photographed and then those pictures along with the statistics on each dog were sent to Kate, Ann and Alane. Kate then put together a spreadsheet identifying all available dogs. Each dog was assigned a number to avoid confusion with dogs of similar names and descriptions. At this point, we were ready to ask other adoption groups who had expressed a willingness to pick the dogs they wanted. This was kind of like a "draft." After the first round of emails and the first draft choices have been selected, a second email was sent out notifying all concerned which dogs had been picked and which ones remained. As always seems to happen, some dogs are picked by more than one group. It's first come, first served, so some groups had to make second round picks and the list was sent to additional groups. Finally all the greyhounds were selected. It's all on paper now, but this is when the physical work really begins. 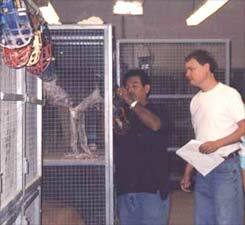 The dogs left Harlingen on Tuesday, April 29, 2003, to be taken to the kennels at the NGA in Abilene, Kansas. There they were unloaded and kept for 2 days to rest. Then they were re-loaded on the bus to begin their journey to the adoption groups on their route. How do you keep up with readying 64 dogs for transport? These dogs had been in GALT's care for approximately 3 weeks - GALT volunteers had worked 14 hours a day - we're talking about 64 dogs here - each has to eat, pee, poop, exercise, nap and most of all, get petted, every day - and much more than once a day. 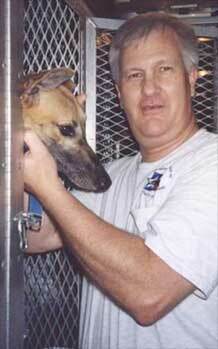 David Kinnard, a GALT volunteer, flew to Harlingen on Thursday, April 24, 2003, to begin his "career" as a kennel keeper. He (along with the rest) just did not anticipate the amount of physical work that entailed and the little amount of sleep he would get. Noreen Reid of GPA Houston arrived on Saturday, April 26, to help. Then Noel Padden arrived on Sunday, April 27, with Susie McQuade and Suzanne Griggs arriving on Monday, April 28. Susie and Suzanne went straight from the airport to the kennel - just couldn't wait to see the dogs and the setup - and get to work. And work it was! Arrival time coincided with turn out time. In this case there were 4 distinct groups: (1) the 4 grumpy guys; (2) the boys, (3) the girls and (4) the brood matrons and girls in heat - all muzzled, of course. 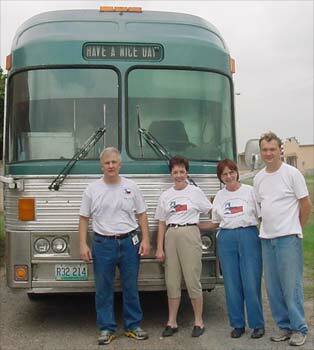 By that time the GALT volunteers had already put in almost a "full day's work." There were lots of introductions, descriptions of personalities and petting. BOY, did the girls like to dig in the sand. One would dig for a while and then walk away. Then another one would take up the digging until she got tired. Then another one would come lay in the hole. The sand was easy to move and lots of fun. There were so many faces and names to remember but some were unforgettable. Star (right), small fawn female, was the most scared of them all. Star captured Noel's heart right away. Beach Volley didn't want to do anything, especially go into his crate, unless his next door neighbor, Druid, did, too. Shy Sandra had disappearing tattoos - there one day and gone the next. This is still an unsolved mystery. And then there was: Fargo, sweet white female; big, handsome and proud Marlin (even with his docked tail); the queen, Pilar (below); feisty Primrose; very sweet boy, CD's Mean Streak, who definitely needs a name change; regal Ritzy (below), and shy, BIG light brindle male, InkeDinkyDo - to name only a few. 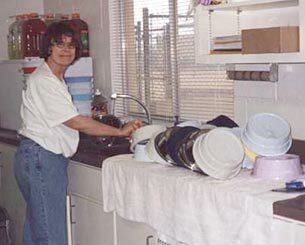 In case you don't know, 62 dogs (2 of the greys that GALT was taking had already been taken to Houston) eat out of 62 bowls, all of which had to be filled on the front side and washed on the back side. Some of the pups had a stomach virus (or were just nervous because they sensed something was going on) so they could not be fed and could only drink Gatorade. One of the big jobs was taking the final list of dogs to be transferred and checking each dog's ears to make sure the tattoos matched and were correct on the list. Each dog's muzzle and collar were marked with that dog's name - you don't want to take a chance on anyone getting mixed up. Finally, at about 10:30 p.m. the group left to get some needed rest. Well, yes, rest . . . but later - there was still paper work to do. Not only was there a list of all the dogs, there was a separate envelope prepared for each dog and there was a separate list of which groups were taking which dogs (eleven groups beside GALT). There were, therefore, 12 large envelopes, each one containing a letter from GALT and in the individual dog's envelope all of the papers received on the dogs going to that particular group with a list of the dogs to be received by the group on the front of the large envelope. Suzanne and Susie also wrote on the front of each dog's envelope any additional information that was known about that dog, such as "very shy - needs extra care" or "very friendly" or "Frontlined 4/21/03." Okay, now after midnight, some rest. But wait - why is the phone ringing? Oh yes, its 5:15 a.m. (Yes, that time really is on the clock) and it's time to get up and go back to the kennel. If you have ever wondered why your dog gets up so early when it has just come from a track that's because those pups get up and out at 5:30 a.m. 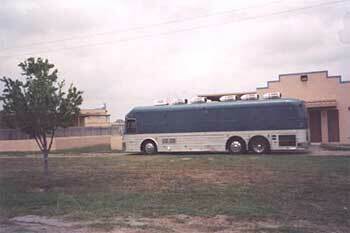 The bus arrived during the night and parked in front of the kennel. Roger, the driver, and his helper were still sleeping. Volunteers were there at 5:00 a.m. and had already started the day's routine of cleaning out the crates, and feeding and washing more bowls. 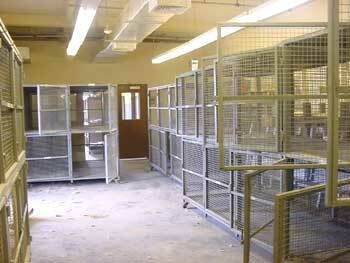 All of GALT's belongings had to be removed from the kennel today so it was time to clean house. Before any of the dogs could be loaded, each one was given a dose of Keopectake and a drink of Gatorade. They were turned out one more time in sequence and let back into the building to cool off for a while. It was determined that the bus could not arrive at the NGA kennels in Abilene, Kansas, before 9:00 a.m. on April 30, 2003. The bus was making one stop in Cameron, Texas, to deliver the 5 dogs being taken into GALT's care (thanks to Pat and Jim Parker for picking them up and keeping them overnight). Based on that timing, the bus should leave Harlingen about 2:00 p.m.
What a sight the loading was! The bus was running and the air conditioning was going full blast. 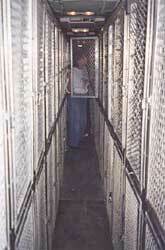 The crates on the bus were on each side of a single aisle, two high (below). The males were let outside (except for Marlin and Druid) and one by one were led to the bus, up the steps and into the bus. They started at the back and loaded each male into a bottom crate. Next came the females (except for Pacheco, Easy and Dottie), but each female had to be lifted into the upper crates because there was no room to jump. 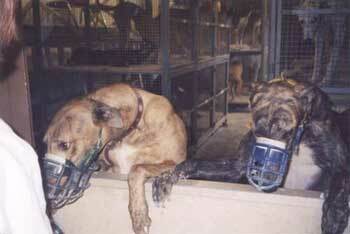 Each dog's muzzle was hung on a hook outside his/her crate. 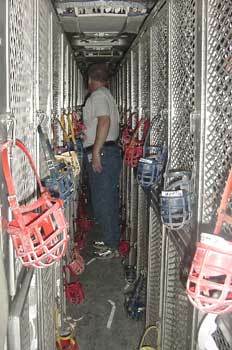 When all of the muzzles were hung a person had to walk sideways down the aisle because it is so narrow. The 5 Dallas dogs were loaded in the front of the bus last because they were being let out first. Although the air conditioning was running in the bus, it was hot and humid outside. It was physical work getting the dogs from the turnout pens to the bus, up two sets of steps and into the crates. Just ask Noel, whose job it was to lift the females into the upper crates. It took a little over an hour to load the 62 excited greyhounds onto the bus. There had to be a "goodbye" to each dog and a pat for good luck (and pictures, of course). Roger called periodically with updates on the progress of the trip. The dogs arrived in Cameron safely and on time. They arrived in Abilene just after 9:00 a.m. on Wednesday with all the dogs in good condition. After resting for two days, the greys (plus a few from Kansas) were loaded back on the bus for their final trip to adoption groups located from Kansas to Pennsylvania. GALT's heartfelt thanks goes to Kansas City ReGAP, GPA-Missouri, Rescued Racers, Shamrock Greyhound Placement, St. Louis ReGAP, Peoria GH Adoption, Greyhound Guardians, Team Greyhound, Michigan ReGAP, Monica's Heart, Nittany Greyhounds, and NGAP. There are so many people to thank for making this possible - Alane, Kate, Ann, Cynthia, Carla Meyers, and many, many others. WE DID IT! 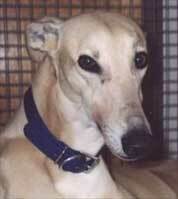 - GALT IS making a difference - one greyhound at a time - or in this case 64!